To report 2 cases of paclitaxel-related maculopathy manifesting as cystoid macular edema (CME) with late petaloid hyperfluorescence on indocyanine green angiography (IA). A 74-year-old man (patient 1) undergoing paclitaxel chemotherapy for gastric and metastatic liver cancer and a 69-year-old man (patient 2) receiving paclitaxel for hypopharyngeal cancer presented with anorthopia in both eyes. 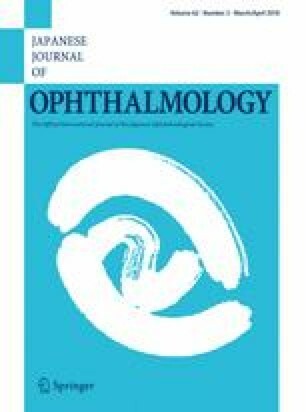 Spectral domain–optical coherence tomography (SD-OCT) revealed macular edema in both eyes of each patient. Fluorescein angiography showed weak petaloid pooling around the fovea in the late phase. IA revealed CME with petaloid hyperfluorescence that matched the region of macular edema detected by SD-OCT. The CME was attenuated in the right eye but not in the left eye of patient 1 at 2 weeks after discontinuation of paclitaxel treatment, whereas it was no longer apparent in either eye at 3 months. The CME was no longer detected in either eye of patient 2 at 3 months after discontinuation of paclitaxel. These cases suggest that paclitaxel-induced CME may result from intraretinal accumulation of intracellular fluid and minimal impairment of the blood retinal barrier. N. Nomi, None; M. Ota, None; M. Fukumura, None; Y. Nuno, None; M. Hatano, None; M. Wakuta, None; R. Yanai, None; K. Kimura, None.